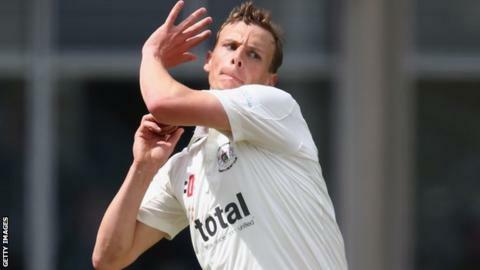 Nottinghamshire have signed all-rounder Will Gidman from Gloucestershire on a three-year deal for the start of the 2015 season. The 29-year-old, who was out of contract at the end of the summer, is Gloucestershire's leading wicket-taker in Division Two this season with 39. Director of cricket John Bracewell confirmed Gidman's exit before Friday's four-day game at Worcestershire. Meanwhile, Gloucestershire have signed New Zealand all-rounder Mark Craig. The 27-year-old, who took eight wickets on his Test debut against West Indies this summer, replaces captain Michael Klinger, who was forced to miss the Worcestershire game because of a neck problem. Gidman was rested for the match at New Road because of "on-going niggles", according the club's physiotherapist Steve Griffin. Alongside his 53 wickets this season, former Durham player Gidman has also scored 711 runs in the Championship, at an average of 50.79. "I have thoroughly enjoyed my time with Gloucestershire and I'm grateful for them for giving me my opportunity four years ago," said Gidman. "I have been flattered by the interest from around the country but I felt that Nottinghamshire was the perfect fit for my cricket and my family. "Nottinghamshire are consistently in the trophy hunt and I am very much looking forward to playing my cricket at Trent Bridge for the next three seasons." Bracewell told BBC Radio Gloucestershire: "Will has his reasons for wanting to leave and they are personal reasons. "He's a Gloucestershire boy at heart, we know that. He's been very successful for us but for personal reasons he has to move. "Statistically, he's the best all-rounder not playing Test cricket. The second division is the breeding ground for talent because a lot of the clubs know they can't purchase players, they have to make players. "It then becomes a difficulty for the club to be able to hold onto them. That's something out of the coaching department's hands."